Doppler Beam Sharpening is a method of processing received radar returns to a radar-image. Today it is an airborne scanning mode in which the echoes from the scanning real beam are Doppler- processed to produce cross range resolution finer than that provided by the real beam alone. The term Doppler Beam Sharpening really has two meanings for historical reasons. The Synthetic Aperture Radar first described by Carl Wiley of Goodyear in 1951 as the system analyzing the radar returns in the time domain, was named as Doppler beam sharpening. Later, the Doppler beam sharpening mode of SAR was introduced as the name for radar scanning the terrain ahead of the aircraft with a variable squint angle mode producing an image on partial plan-position indicator (PPI) display. This is a frequency-domain explanation. Using of radar with real-beam mapping has a relatively poor angle resolution provided by the half-width angle of the radar antenna. In typical fighter radar with an antenna-dimension of around 40cm diameter, the antenna beam width is around four degrees. Doppler beam sharpening uses a coherent low-PRF radar mode. The radar returns of a point have a defined Doppler frequency depending on its relative radial speed. The far away an objekt from the aircraft track, the lower is its radial speed (shown as red vectors in the Figure 1), and the lower is its Doppler frequency. 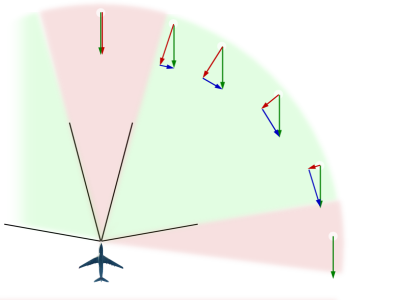 If the speed of the aircraft (and the normalized Doppler frequency of points in flight direction near the aircrafts track) is known, then the decreased Doppler frequency is a measure of the azimuth deviation. Resolution was related to aircraft ground speed and to antenna pointing angle with respect to the direction of flight, but typical azimuth resolution is around 0.5 degrees. This calculation can be done for every point (i.e. every pixel) of the radar image. The result is an image with a higher resolution, so as used an antenna with higher direction. 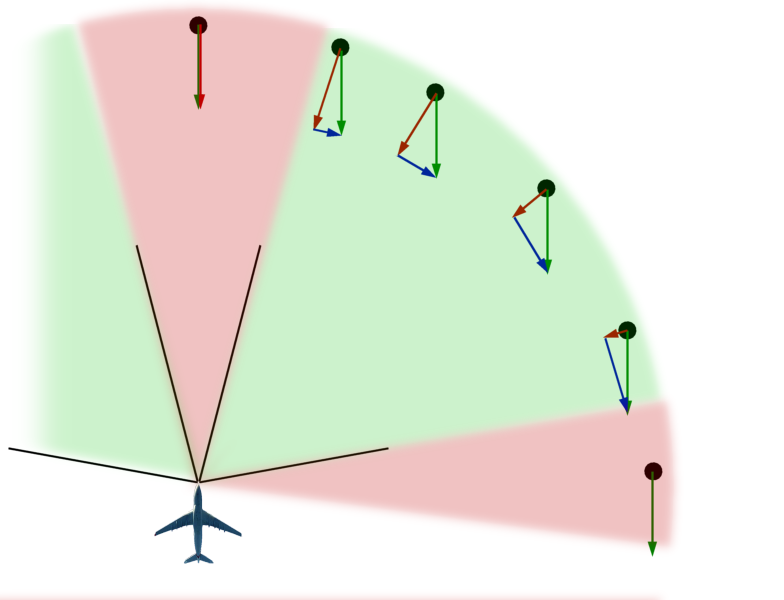 When the antenna is pointing close to the aircraft track, there are not sufficient differences in relative ground velocity in the area being examined, so Doppler beam sharpening is ineffective within about 15 degrees of track. In the 1970s, the Westinghouse AN/APG-66 radar fitted to early-model General Dynamics F–16 fighters offered a Doppler Beam Sharpening mode.